Teams engaging in assistive technology research should include expertise in the domain of disability itself, in addition to other areas of expertise that are more typical in human–computer interaction (HCI) research, such as computer science and psychology. However, unexpected problems can arise when HCI researchers do not adequately plan the involvement of domain experts in a research project. Although many research teams have included domain experts when designing assistive technologies, there has been little work published on how to best involve these experts in the research process. This paper is a first step towards filling that void. Based on the authors’ own experiences involving domain experts in research, as well as those documented in the literature, five types of domain experts and three broad roles that domain experts can play are identified, and five guidelines for their involvement are presented. 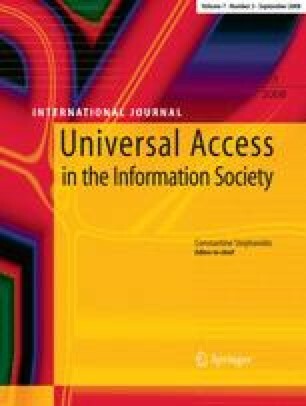 This analysis will be useful to anyone in the assistive technology and universal accessibility communities, especially those who are in the early stages of conducting research in this area. It is intended to lay the foundation of best practices for involving domain experts in assistive technology research.